"If you're looking for something different, try Ian Winn's debut novel... It has all the travel fiction requisites in spades: trippy drugs, local eccentrics and dirty dreadlocks as Winn recounts his travels from the pyramids of Egypt to the beaches of Goa with crazed enthusiasm and humor." "Inventive, brilliantly realised Characters. Winn displays a rampant thirst for mysticism and self discovery. one cannot help being won over by winn's enthusiasm and Intellectual energy"
New scenes. New characters. New cover. Meet E, a budding marine biologist who, on the cusp of receiving his degree, has a spectacular near-death experience while releasing his pet octopus, Clyde, back into the wild. The ensuing, sometimes bewildering, journey will tear him away from the sciences, alienate him from his family, his girlfriend, society, the law — and possibly ruin his life. Kicked out into the world he’s faced with a choice: continue the path he’s been walking since childhood or keep a sworn oath to share what he’s seen in the only thing big enough to hold it: a novel. Set in secretive, native, analogue California — from the kelp beds of Emerald Bay to the redwoods of the Emerald Triangle by way of a Hollywood A-lister’s grow-house and the Thai/Burmese DMZ — Californian is one man’s hilarious attempt to follow a calling instead of a career. To shine his light into the darkness of humankind before it goes digital. Before it’s too late. Choose your friends wisely. Take chances. Safety third. The age of the octopus is here. Currently seeking publication. No schmucks. You can take the Ian out of California but you can't... 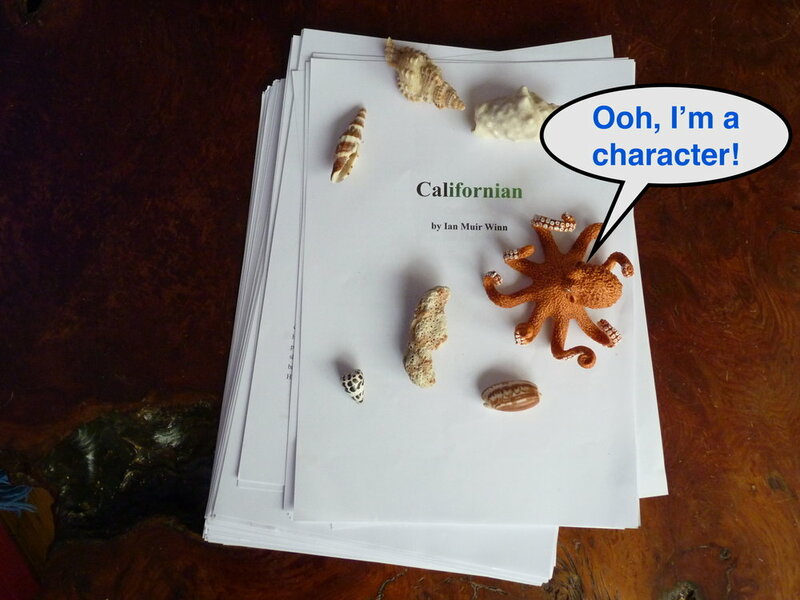 The point is the new book is called Californian.